Richard - It's not at all efficient or effective for the female. Well, it's effective. They do have offspring as a result of it, but it's not the female that drive it. Ben - What actually happens? Once the male has punched his way through and delivered his sperm, presumably there are specialised organs then within the cavity that take the sperm to the right place. He can't just make a hole wherever he wants it and the sperm just finds its way to an egg or can it? Ben - So, from the male's perspective, he can just deliver his sperm as and where. If there are sperm storage organs then that like in many other insects would imply that you can get multiple matings. Does this mean the female actually gets stabbed many times and then selects out the sperm that she wants to use? Richard - There's no evidence to show that the female can select which sperm she wants to use, but you're absolutely right. There are multiple matings upon multiple matings. The males, we know, mate tens and tens of times more frequently than females need to be mated in order to stay fully fertile. So, we know that this is bad for females because the males are just mating far more than they need. 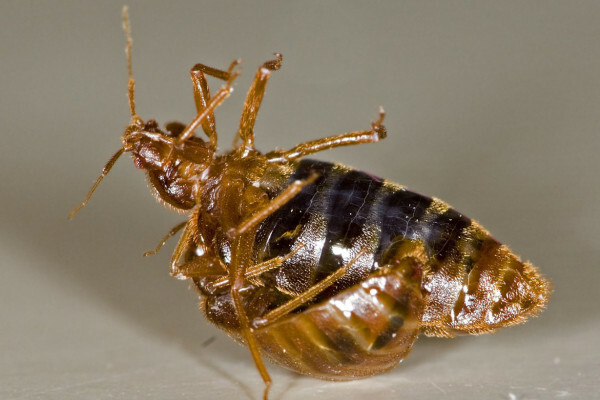 A female bed bug needs to mate about once every 5 weeks and it's likely to be 5 or 10 times a day that the males will mate with the females if they get the chance. Ben - How do the females actually survive this? Well, the clue is in the name, isn't it? It sounds traumatic. Richard - It is traumatic. We know that they don't survive as well as they would if they were only receiving mating every 5 weeks. We've done these experiments and we've shown that females pay a cost in terms of their longevity, their lifespan of about 25% as a result of natural mating rates. So we know that this mating system is bad for females, but they don't have any control over it. It's a male-driven mating system, so the males impose the mating rate on the females. Ben - I mentioned at the beginning that there are not very many species that actually undergo this and I can see why. What is the sort of selective pressure that caused this to evolve? You would think as it is so costly for the females that it would very quickly adapt out. Richard - Yeah, that's right. If you imagine a biological system where males and females are working together to produce the most offspring between them, you would expect it to adapt out as you say. But that's not what we think is happening. We think there's a conflict between males and females and what's in it for the males is that it's always the last male that sires the most offspring. And so, males are competing to be the last one and that's what's driving this elevated mating rate. Ben - Now we also mentioned earlier that there is, of course, as with any injury there is a risk of infection. What adaptations do the females have in order to be able to heal, to repair the wound, and to stop themselves just being taken over immediately by a bacterial or fungal infection? Richard - Well, in the bed bug, there's a very similar system in the whole family, the Cimicidae and they all showed different levels of adaptation. But in the bed bug, the females have a little pocket which receives the sperm, this little pocket is called the spermalege, and it's packed full of immune cells, something like our white blood cells has a very high concentration of them in this little area. It looks like a little patch of cotton wool and it's probably about the size of a large grain of brown sugar. This little area of immune cells does a very good job at mopping all those bacteria and also, stopping hemolymph from leaking back out through the wound that the males make. Ben - Now, species like bed bugs have just what we call an innate immune system. So, unlike our immune system which can learn to recognise a threat and then adapt, and then the next time you get infected with the same bug, you are even better at fighting it off. With just the innate system that they have, presumably, it must be really quite aggressive to just fight and kill off everything. Richard - We've always thought about insects as having very basic, simple, and not very advanced immune systems and to some extent, that's right. But it is a very effective immune system. It has several different components to it and one of the most important components is lysozyme. It releases lysozyme and this chops up bacteria. It can detect bacteria being introduced and then elevate these various components of its immune system and just fire all these toxic chemicals at the bacteria and hopefully wipe them out. In the bed bug, it does a pretty good job in that immune organ. Ben - So, does that mean that there's something that we can learn from the bed bugs about potentially how to fight off infections or to make new antibiotics? Richard - Antimicrobial peptides are one of the things that insects have that we've been exploring as a medication. What's interesting about insect immune systems is that bacteria don't seem to evolve resistance to them. So we've all heard of antibiotic resistance, which is rendering all of our antibiotics that we use in the medical profession useless because the bacteria are evolving to cope with them. And we don't see nearly as much resistance to antimicrobial peptides which is one of these tools that the insects use. So yes, there are lots of people working on that very question - can we learn from insects to help ourselves? Next What is Ash Dieback?